January is the time of year for breaking old, bad habits and forming new, better ones. You may have decided that this year you want to write more or be more creative, and maybe even have gone so far as to identify habits that you think have been holding you back. What if I told you that list of bad habits is about to get a whole lot shorter? Many of us have habits that cause us to be at constant war with ourselves, convinced that being able to drop them will bring only good things to our lives. These habits might be left over from school, where procrastination, doodling, and untidiness are cardinal sins, or maybe it’s because these things aren’t usually part of the image of someone who seems to have it all together. However, some of these habits (like procrastination, messiness, doodling, and simply not writing) may actually be positive. They can increase your level of creativity, your productivity, and decrease stress. I’m here to show you how you can embrace these “bad” habits to help your writing. Most people procrastinate at least every once in a while. There are many reasons people stress-watch Netflix instead of getting down to work — maybe they’re unsure of how to get started, or afraid to fail, or simply don’t feel like it. Or maybe, to paraphrase Aaron Sorkin, creator of the TV series “The West Wing,” they’re just thinking. Putting a project off rather than starting on it right away allows time for new ideas to develop and can prevent you from taking the most obvious route. The cofounder of Apple, Steve Jobs, believed in guilt-free procrastination, subscribing to the Ancient Egyptian idea that rather than being a negative, procrastination is merely waiting for the right time to complete a task. This concept goes along with strategic procrastination, which is putting off tasks in order to be better able to handle them when the time comes to get to work — usually through having come up with great ideas in the meantime. The success of these procrastinators supports the idea that procrastination is not a guarantee of failure, and in some cases, can actually help you along the path to achievement. As a chronic procrastinator myself, I admit that finding out that putting off tasks can actually help, not hinder, creativity and the writing process was a bit of a relief. Now I can tell myself and others that I’m not just procrastinating, I’m helping my creative process! And I can point to studies that will have my back on this idea. So Jihae, now a professor at the University of Wisconsin, conducted an experiment in which she asked subjects to come up with new business ideas which were then rated for creativity. Some of the participants played Minesweeper or Solitaire for five minutes before thinking of ideas, while another group started right away. As predicted, the ideas provided by the group that was allowed to procrastinate were judged to be more creative. Learning about a task and then putting it off allows your mind to wander, which encourages divergent thinking and increases your chances of coming up with a really great, original idea. Not starting right away allows ideas and solutions to occur to you more organically rather than forcing yourself to come up with them on the spot, which means they have more potential to be unique and effective. However, there can be too much of a good thing. A third group in Jihae’s study waited until the last minute to start on the project and ended up with uncreative ideas. So, when procrastination goes too far, you are forced to go with your first, most conventional ideas instead of having enough time to come up with original ones. Also, not allowing enough time means that work likely won’t be of the quality it could be. Ben Franklin’s quote “Don’t put off until tomorrow what you can do today” may sound like good advice, but when it comes to writing and creativity, it must be taken with a grain of salt. Procrastination can do great things for your work — as long as you’re making sure that you leave enough time to actually complete the project. 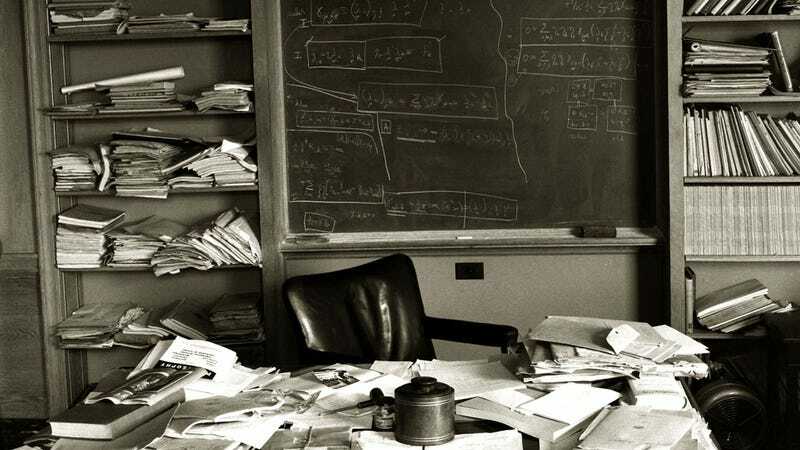 Einstein once said, “If a cluttered desk is a sign of a cluttered mind, of what, then, is an empty desk?” He certainly lived up to this statement, keeping a famously cluttered desk. Mark Twain is another well-known mind that chose to work in an untidy workspace. Their habits certainly didn’t hold them back, and I’m happy to inform you that it doesn’t have to hold you back either. You may have heard that a tidy environment is best for promoting productivity, but this adage may not be true for everyone. While tidiness comes naturally to some, and there is plenty of anecdotal evidence to suggest that some people do work better when things are orderly, you shouldn’t force yourself to spend time tidying up simply for the sake of doing so. It has been ventured that busy minds tend to go along with untidy spaces simply because time spent in their workspace is time spent working, not organizing or color-coding. Therefore, messiness is not the enemy of productivity — and they may even go hand-in-hand. For those unconvinced, if you spend an hour tidying your workspace, do you think you’ll be an hour more productive because of it? If not, leave your desk the way it is — it could even help you be more creative. Studies done by researcher Kathleen D. Vohs at the University of Minnesota came to the conclusion that being in a messy room makes people more likely to stray outside of convention, therefore boosting their creativity. In one of the experiments, 48 participants were placed individually into one of two rooms, one tidy and one messy, and asked to write down as many ways to use a ping-pong ball as they could. Independent judges then rated the answers for creativity. As hypothesized, though there was no difference in the amount of answers that the groups came up with, subjects in the messy room came up with more creative responses than those in the tidy room. This is good news for those of us who have a hard time keeping all the papers, folders, and miscellaneous clutter on our desks organized. As writers, creativity is key to our work, so not having to tidy my desk and getting a potential boost to creativity sounds like a win-win situation to me. If you’re the kind of person who needs order and cleanliness to be able to think straight, keep doing you. As for myself and the rest of us for whom keeping workspaces immaculate doesn’t come as naturally, it is indeed good to know that our messy inclinations aren’t harming our productivity as much as one might think — and are even helping boost our creativity. Doodling often gets a bad rap. While many consider it to be a waste of time (especially when you’re supposed to be working on something else), and a sign of an idle or distracted mind, the truth is closer to the opposite. As anyone who doodles in school or meetings knows, and as studies have shown, doodling while doing another primary task (such as listening or thinking) actually improves focus and recall of information. Sunni Brown, author of The Doodle Revolution: Unlock the Power to Think Differently, refers to doodling as an “act of cognition” that calms one’s state of mind and helps focus. Doodling forces the mind to stay in the present rather than wandering off into a daydream. It requires enough cognitive effort to keep your thoughts from drifting, but not so much that you’ll be distracted from your primary task. For writers, this idea means that doodling while doing the brainstorming or drafting portions of your creative process makes you more likely to keep focused on what you want to be thinking about. The less time you spend daydreaming, the more productive you’ll be. Doodling can also encourage creativity. The act of creating artwork (no matter how simple or unskilled) causes stimulation in different parts of your brain, which can result in the discovery of new solutions or ideas. Doodling while brainstorming can help increase the level of creativity of the ideas that you come up with. Also, if you doodle by illustrating what you are thinking about, this effect is enhanced by literally giving you a new way of looking at your work. Another result of doodling that is beneficial to writers is relaxation. 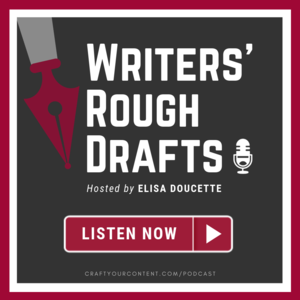 Writing can be stressful if you’re dealing with writer’s block, can’t quite make that plot twist work, or are simply coming up against deadlines. The repetitive motions doodling often involves can be quite soothing, and unlike in your regular work, there is no pressure to get anything right. Doodling is a way that you can disengage from the stress while not putting your writing out of your mind completely. Whether you’re working on a novel or other big project, or just trying to keep up with the daily grind of being a writer, you may feel guilty whenever you spend time away from your work. Perhaps you feel like you haven’t earned time off or that spending time away from your projects will put you hopelessly behind schedule. Well, you may be in even more trouble if you don’t take some time to relax. Giving your mind and body a break is essential to writing well. In addition to health benefits that include stress relief and reduced computer vision syndrome, research suggests that time away from your project — be it a few hours or a full-blown vacation — increases productivity and even creativity. Without giving yourself time to recover, the ability to think at the level required to do your job well is impaired. The longer you spend working without time to relax, the more you’ll be impacted by things like decision fatigue and loss of focus. Adequate recovery time means having the freedom to not think about your work at all — it will still be there when you get back, and you’ll have a renewed mind and a refreshed attention span to deal with it. You may even gain a fresh new perspective. Taking time off to explore other activities, like traveling or learning a new hobby, can bring new insight to your creative projects when you return to them. Perhaps you’ll come across unique practices or concepts that will expand your mind and your perspective, and that can be applied to your work. Don’t think of it as neglecting your writing, think of it as gathering influence and ideas that will help you to be a better writer. It may seem counterintuitive that you need to not write in order to write well, but it is essential for your creativity, productivity, and your overall well-being. Taking time off is not an indulgence — it’s a necessity. As long as it doesn’t turn into a permanent vacation, your working self will only thank you. There will always be people that try to tell you that your procrastination, your messy desk, your doodling, or your time spent doing anything other than writing will prevent you from being productive. The truth is, unless you take any of these to the extreme, all of these habits are more likely to help your creative process than to hinder it. So don’t feel bad about putting your work off in favor of a good book or two. Embrace the chaos on your desk. Give yourself some designated notebook doodle-space, and don’t feel like you need to hide it from people who know you should be working. And don’t be afraid to go on that weekend ski trip or start learning the guitar, because a weekend spent not writing is not a weekend wasted. The trick is to strike a balance where you are reaping the benefits that these habits have to offer while avoiding their pitfalls — and it may take a few tries to figure it out. The good news is that now that you aren’t focusing all your energy on trying to break your “bad” habits, finding your balance will only get easier and easier.